No to War! No to U.S Drones! Canada Out of Afghanistan! 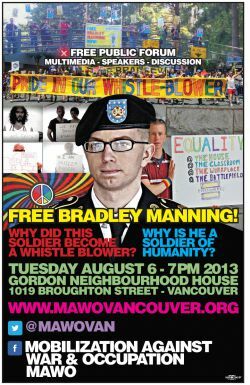 Free Bradley Manning Now! No War on Iran! “Gordon Neighbourhood House and the Association of Neighbourhood Houses (ANH) are not sponsors of the activity described, and neither Gordon house, nor ANH assume any responsibility for, and provide no endorsement of, the activity”.